Drama is Easy, Comedy is Hard. 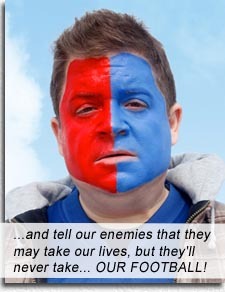 Oswalt plays Paul Aufiero, the eponymous BIG FAN of the New York Giants, whose favorite player, Quantrell Bishop (Jonathan Hamm) nearly fatally bashes Paul one night for seemingly stalking him. Rather than bring a lawsuit against Bishop, which would mean Bishop’s suspension and therefore the crippling of Paul’s favorite team, Paul drops all charges and pretends amnesia to a nosy detective. Written and directed by the writer of THE WRESTLER (Robert D. Siegel), BIG FAN is a hard closeup of the pathology and pathos of being so deep into a fantasy that the real world cannot compete let alone offer any solace. As director Darren Aronofsky simply followed The Wrestler through his mundane workday, Siegel reveals Paul’s tics and quirks simply by training his camera on him: Paul sits in his toll booth composing screeds to deliver on sports radio call-in shows; when he does call in, his delivery actually sounds scripted (testament to Oswalt’s talent), yet his best friend listening in, Sal (Kevin Corrigan) believes him to be a prophet; Paul and Sal regularly catch Giants games – from a portable TV in the Giants Stadium carpark, cheering as wildly as if they’re in the bleachers; Paul lives with his nagging mother (Marcia Jean Kurtz), holed up in a small bedroom which offers no privacy. The tragicomedy is cringeworthy. Gino Cafarelli plays Paul’s lawyer brother, who complicates matters when he brings charges against Bishop without Paul’s consent; Serafina Fiore brings her outsize breasts to the role of Paul’s sister-in-law (I still cannot understand why women with outsized fakes believe anyone would take their “acting” seriously when faced with their elective surgery orbs of distraction); Matt Servito (“the lovely Agent Harris” from THE SOPRANOS) is the nosy detective who cannot understand why Paul is protecting Bishop. Tension and black humor drives the last act, with some twists that nicely augment Paul’s dementia, as he seeks revenge not on Bishop, but on a rival team’s fan (Michael Rappaport). And Patton Oswalt delivers with a surprising conviction that makes me wonder why he went so long in comedy before blasting into drama at such a mustered level. Director, Writer: Robert D. Siegel. Starring: Patton Oswalt, Kevin Corrigan, Michael Rapaport, Marcia Jean Kurtz, Serafina Fiore, Gino Cafarelli, Jonathan Hamm, Matt Servitto.